Breast cancer: Are you aware of it? Thanks to the many faithful readers who took time out of their busy weekends to email me the great news that millions of dollars are going to be spent creating a Family Circus movie. (The comments on that story I linked to are actually pretty great, my favorites being “Hell yeah! This means The Lockhorns can’t be far behind! Team Loretta!” and “Who asked for this? Ida Know. Who wants to see it? 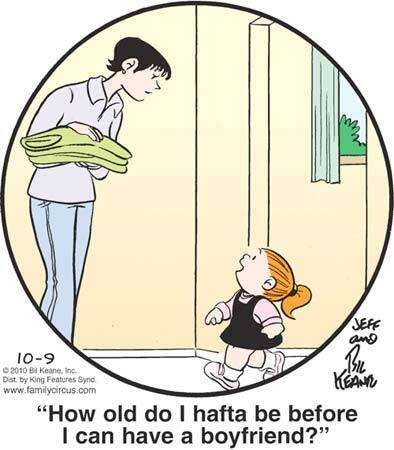 Not me.”) Apparently the strip is already moving into the edgier subject matter that Hollywood demands, with Dolly coming to the conclusion that her only way out of the Keane Kompound is as a child bride. If the endless “Pam and Jeff reminisce about the violence Crankshaft has done to the English language” strips had to end — and, really, they could have kept at it for as long as comic strips continue to exist as a medium, as far as I’m concerned — then this is a pretty good way to wrap it up. Our two protagonists, having briefly rediscovered the emotion that normal humans call “happiness,” cringe in terror as they realize that Crankshaft’s soul, having been rejected by both God and Satan, has returned to his mortal form. Adrian sure is setting Mary up to hate and fear this “outspoken” “type A” lady. One can only imagine what sort of terrible description of Mary she’s been giving to Jill. I’m starting to guess that she’s doing the meddling biddy equivalent of putting a couple of bugs in a jar and shaking it up. WHAT HAPPENS NEXT: Six to eight weeks worth of plotlines in which Tommie is not deemed interesting enough to appear.